Who's got coupons again? MBA and I decided to go to the New Shogun on Alicia Parkway. I have been there thousands of times. They use to have an awesome dinner deal of all you can eat, but now they only offer half off selected sushi and rolls every night. I normally eat sushi but MBA likes the show. 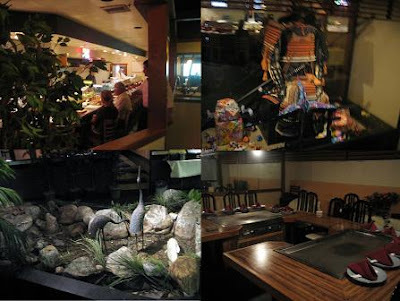 This was our second time here for the Teppan side and we had a buy one get one free coupon, so I said why not. MBA better feel the love I have for her for eating teppan since it's really all show and the food isn't that good! When you have to dress the meal up so much, you shouldn't expect much for taste. I spent most of the meal taking pictures so I can do an awesome blog, but let me just tell you that my pictures are deceiving because I try to make always make food look delicious! We decided to get the Special Shogun Dinner that included Shrimp Appetizer, Soup, Salad, Vegetables, Seasoned Rice, and Ice Cream. The soup was a light mushroom broth with subtle flavor. It was light and simple. They give you their normal salad of fresh vegetables and sauce, which was decent. I have had much better dressing on my salad. So began our journey of teppan for dinner. We opted out of the fried rice, but the lady next to us did. 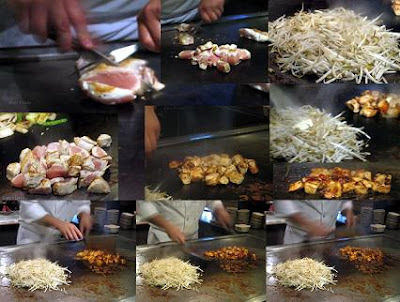 First the chef lit the grill on fire and began to make the eggs for the fried rice. It looked nice, but I wouldn't pay $3 more just so I can get regular fried rice. He also tossed on the assorted vegetables and began cutting them into small pieces. After he finished the fried rice, he started grilling the meat. The steak was not put on the grill yet because it would get over cooked. First he prepared the shrimp appetizer with butter and lemon. There were two dipping sauces. A wasabi based soy sauce for the meats and a tangy daikon sauce for the seafood. They should have used the daikon sauce on their salad, because it would have tasted much better than the heavy dressing they used. The shrimp was lightly flavored with lemon and a good size. MBA really wanted to see the Onion Volcano. I tried my best to capture the moment, so bare with me. You will see the volcano as he poured oil into it and lit it on fire. It's cool, but I'd rather have yummy food versus a show. The lady next to us ordered the scallops and they looked like a generous amount. Everything was very lightly flavored, I guess you really need the dipping sauce to bring out the taste . Every course was prepared separately and he gave us the mixed vegetables first. Even though they were on the grill since the beginning, they were still crisp. There was really no flavor on them. Next came the steak. I asked for medium rare to rare so he barely cooked it and put it on my plate. They were lightly flavored with butter and soy sauce. Luckily I like the flavor of steak by itself, so I was fine with the lack of flavor. The meat was tender. Afterwards he began flavoring the chicken. He added the teriyaki sauce and butter. As he was waiting for the chicken to cook, he also worked on the bean sprouts. It was lightly flavored with butter and stir fried along with the chicken. The chicken had flavor but was very tough. In order to get a nice picture, I barely picked at the food so that I can take nice pictures at the end. From start to finish it's a long wait since everything was prepared one at a time. 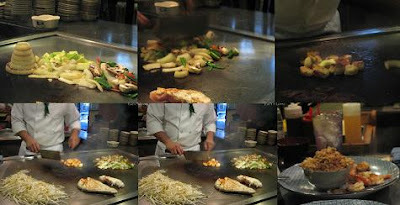 I am not a big fan of Teppan preparation where you can't eat all the food at once. With vegetables being one of the first thing plated, I wouldn't eat it unless the meat was there and you would have to wait until the chef gets to it. 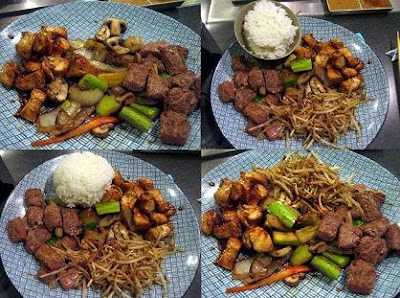 So my plate was full of white rice, New York steak, teriyaki chicken, bean sprouts, and mixed vegetables. Our meal came with ice cream and we chose Green Tea. If our meal didn't come with ice cream I would have ordered their Tempura Ice Cream with Green Tea. OH MY GOODNESS! That is one of my favorite desserts. My sister and I often come here just to get dessert! Now we don't even share anymore because we each have to have our own! If you ever go there, try it! MBA has had it too and she loved it! Like I have said many times, anything fried can't go wrong! All in all the meal was decent. I would NEVER go there for Teppan if I didn't have a coupon and MBA didn't make me. 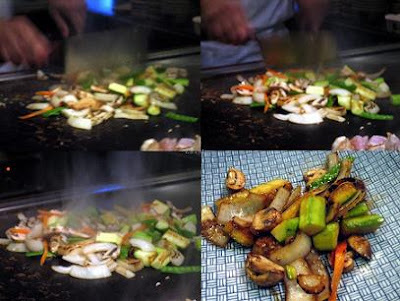 If you want good food, then Teppan is never the way to go. I am devout foodie so I don't need a show, just show me the delicious food! Another reason why I'd never go to Teppan is because it's expensive for what you get. If we didn't have the coupon, our meal would've been almost $60 with tip. I also have a complaint on how stupid they were. Luckily I am not aloof and don't look at my bills. My bill was $30.80 and they ended up charging me $76.77! I was like the WTF You have got to be kidding me. That was more than the original bill! It took us forever to flag down the server and tell her, she was just like whoops. She didn't really apologize or anything and took it away. I am still waiting to check my credit card to make sure they voided that transaction. Can we say lower tip? 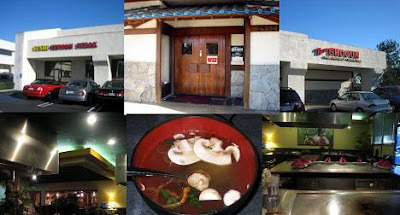 I will probably be back again for sushi, but definitely not Teppan and service. The pictures look cool, although one collage looked like it was missing some pictures. Maybe it's just my browser. I can't believe they just charged you a random amount - that is lame! Their tempura ice cream is the best though!! YUM! 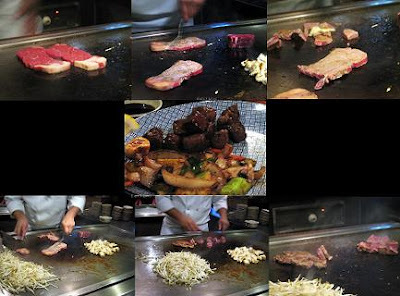 I would never go for the teppan though - what a rip off! 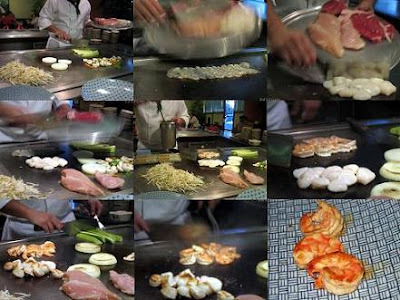 Yes the teppan is such a rip off! I still have horrible nightmares about the one you made me go with you up in Greenfield when I was young. I purposely blacked out the sides on the collage to have the center be the end result.